Growing up in the Pacific Northwest, Aaron Mazarati’s grandmother taught him at an early age that music is the ultimate form of expressing himself. Through her early teachings of expression in rhythm, he accessed his desire to immerse himself into music. Whether it was talent shows at school, church band & choir, or creating numerous bands, Aaron was destined to display his performance as an influential artist. At the age of 14, his dear grandmother was terribly taken from him and his family. To cope with the devastating loss, Aaron took on an interest in poetic expression as his method of therapy. Poetry, alongside his grandmother’s belief in him ultimately led to his passion and skill in creative writing. In addition to his love for music, Aaron Mazarati is also highly passionate in advertising copywriting and that fascination comes directly from how advertising concepts tap into people’s subconscious in an almost identical way as music does. This inherited passion propelled him to a degree in Journalism/Advertising from the University of Oregon. It was there in college he discovered his piles of unique writings easily converted to song prose. 2017 is his breakout year, as he just released is best-to-date album,“Black Tees x Blue Jeans” and immediately go on a West Coast University tour. The album was influenced by the life of Californication’s lead character, ‘Hank Moody’, due to the fact that Aaron Mazarati and Hank are both exceptional writers in the midst of LA’s dark beauty and all the craziness that comes with that. 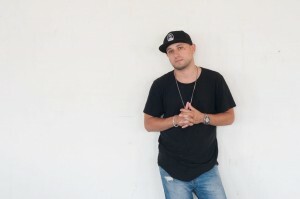 The album most definitely showcases Aaron’s development as a songwriter and artist, which has been built upon his three EPs, three mixtapes, plus countless collaborations. Aaron Mazarati has his foot in the industry door and he’s about to kick it in. This year has been extremely exciting and at the same time highly challenging. My music career has taken some huge leaps this year without a doubt and I couldn’t be more proud of how everything is finally panning out. Growing up I’ve always been that creative type. At a super young age, I begged my parents to let me be involved with as many music programs as possible (choir, band, lessons, etc.). It wasn’t until my grandmother’s passing at 14 years young that I was able to tap in to my writing gift. The first musical memory is an odd one none the least. I remember at the age of three I was with my mother at the mall and while she was perusing racks I heard music coming from the center of the mall and was drawn to the melodic bliss. I then wandered closer to the sounds without regards to what my mother was doing. Once I found where the music was coming from I broke out into dance for the entire to enjoy. Meanwhile my mother freaked out trying to find me and grabbed security. They went all over until they finally came across a large crowd surrounded around an unknown act. As she approached closed closer she could see that in the center of this mob of people was me and all my Michael Jackson moves. Its crazy I remember this so vividly but I’m glad I do. You just released your album , “Black Tees x Blue Jeans.” Can you talk about putting this collection together? How is it based on the Hank Moody character in the hit show Californication? Yeah, so building this project actually came with some ease due to fact I was so inspired and really was tapped into my ability to express my passion. So I’m a huge fan of Showtime’s show “Californication”. In it, the main character, Hank Moody, is an esteemed but erratic writer who frequently becomes embroiled in bizarre, borderline scandolous encourterments in Los Angeles and in so many ways I am this. Also, Hank pretty much only wears black tee shirts and blue jeans throughout the 7 season series and that’s about the only thing I drape myself in. How do you think this new album shows the growth that you have gone through as a musician? How is it different or similar to anything else that you have released? So one thing I find fascinating about my music and my process is that I can literally see my overall improvement as an artist develop more and more each day. There is not a day that goes by that I’m not a better musician than the day before. Its a beautiful thing and I feel like if it wasn’t this way then I would have a huge problem on my hands. Thank god I grow more and more each day. The difference between this project and all the other projects I have created is that this one I feel I really found my position in music which in-turn is reflected to my presence throughout recording. My sound is polished, my confidence is through the roof, my talent is at an all-time-high, but don’t get me wrong I’m the same ol’ Aaron Mazarati, just more refined than I’ve ever been. How creatively involved were you with the making of the first single’s video? I actually wrote and directed the video so I guess you could say I was the most involved. Do you find it difficult to balance being an artist, label CEO and publishing owner? What position do you find that you are most passionate about right now? As one could assume, yeah its very difficult to balance all three rolls but thank god for my team because without them there is no way I could survive the one man circus I’ve been Ringmaster to for so long. For years I did it all myself but artists need realize there is no way you can make it on your own. Its just simply impossible. So with a team to delegate tasks to I’m able to put the wheels in motion much more efficient and sufficiently. I will always be an artist first and foremost. Everything I do outside of artistry is for my artistry. I have a borderline addiction to songwriting so its safe to say that isn’t going anywhere anytime soon, nor do I want it to. The music industry is a very interesting and complex beast. Over the course of the last 20 years it has definitely evolved into something no one could have ever predicted, but thats life. Either you keep up with the times or you’re destined to fall behind. I never would have thought that the industry would be so over-saturated with music. These days you have to stand out over millions of dreamers and talents. Exposure is easier these days but standing out definitely isn’t. Artists can’t let themselves get discouraged by this but instead use it as motivation to out shine over those attempting to visit our industry. Naturally I knew that it music was going to be a long and bumpy road but if I stay dedicated with tenacity and work harder than everyone else, I will eventually get to where I want to be. I’m looking at the light at the end of the tunnel and I’m within an arms length away of being where I want to be. Working with Juelz Santana, Jay-Z, Wiz Khalifa, or ASAP Rocky would put me on cloud nine. One of my goals throughout my career is to work with all of these creators at least once. If we happened to work together on multiple projects, I wouldn’t be mad at that either. I want people to enjoy themselves. Music has gotten me through so much throughout my life and I have vowed to contribute to the music and all its creators that have done so much for me personally on my own journey. Music has the ability to take the human mind on a escape route momentarily and this has always fascinated me. So once I found my gifted talent I knew my role in this life is to spread that same love that was spread to me. My music is intended to make the listener feel good while stimulating subconscious emotions. All I want everyone to do is enjoy themselves in my music and I promise it will compliment every single one of their lives. I have endless unreleased music that I plan to release in March of 2017 with another album. So in the meantime, please enjoy my current album, “Black Tees / Blue Jeans” on iTunes until I give you all more beautiful music to add to all of your worlds. An Interview With Producer-Singer-Songwriter, JARED EVAN!